RJ45 RJ11 Network Cable Tester CAT5 CAT6 LAN Patch Cable Testing Kit by Unknown at Andy Pemberton. Hurry! Limited time offer. Offer valid only while supplies last. Description The NT-468 Network Cable Tester tests the functionality of network cables with twisted pair, straight and crossover wire configurations. Description The NT-468 Network Cable Tester tests the functionality of network cables with twisted pair, straight and crossover wire configurations. Resolving network connectivity issues is often a mere process of elimination. This network cable tester helps determine determine whether or not a network cable is the source of the problem. To use, connect one end of the network cable to the "Master" controller and the other end to the "Remote". Turn the switch found on the Master controller to the on position to begin testing. If the network cable is working properly, the Master controller and the Remote will illuminate sequentially with green lights. When testing cables with RJ-11 connectors, lights 1 through 6 should illuminate. When testing cables with RJ-45 connectors, lights 1 through 8 should illuminate. Resolving network connectivity issues is often a mere process of elimination. 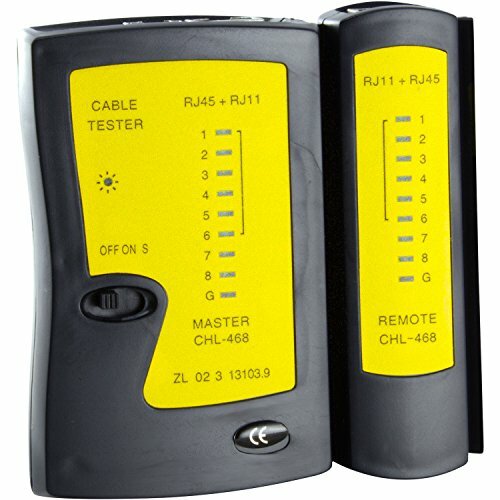 This network cable tester helps determine determine whether or not a network cable is the source of the problem. To use, connect one end of the network cable to the "Master" controller and the other end to the "Remote". Turn the switch found on the Master controller to the on position to begin testing.